What made Graphic Novels Break Through? Comics historians can point to the antecedents of the graphic novel when looking for clues as to how the breakthrough to the mainstream happened. They can point back as far the early 1960s when Little Brown brought Tintin to these shores, and early graphic novels published by NBM in the 1970s, Gil Kane’s books His Name is Savage & Blackmark, and Will Eisner’s, A Contract with God to name a few. These were all critical. However, 1986 was the year that the real transformation began, with Batman: the Dark Knight Returns, Watchmen & Maus. Dark Knight & Watchmen made a lot of noise & promoted the idea that comics were changing, but Maus did more than that. Maus was such powerful reading that general readers didn’t look at it as a comic book or a graphic novel (the term hadn’t stuck yet) but as a new kind of reading experience. Maus almost single handedly showed the world outside comics that graphic novels could relate trans formative reading experiences. Maus actually became a staple of high school curriculum. Unfortunately, no books of the magnitude of Maus followed for several years, but by the late 1990s, a handful of graphic novels had surfaced in the mainstream, including, Dan Clowes’ Ghost World, Joe Sacco’s Palestine, Chris Ware’s Jimmy Corrigan, Scott McCloud’s Understanding Comics, and Neil Gaiman’s Sandman graphic novel series. All these books showed that mainstream readers had more in common with comic book readers than they might have thought, & the rest, as they say, is history. To learn more about the history of the graphic novel, read my book, Faster than a Speeding Bullet: the Rise of the Graphic Novel, available now. 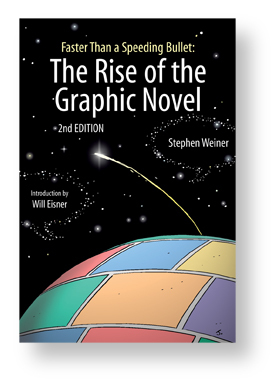 Author Steve WeinerPosted on November 28, 2012 Categories BlogLeave a comment on What made Graphic Novels Break Through? If Jack Kirby were still alive he would have turned 95 on August 28th. Is there anything in the history of mainstream comics that emerged unshaped by Jack Kirby? He put his stamp on superheroes in the 1940s with his dynamic artwork. He and Joe Simon created the Romance genre in the 1950s, and in the 1960s he reinvented the hero concept by co-creating the great majority of Marvel heroes, many of whom have exploded onto the big screen in the last 2 decades. The original intention of ‘The Graphic Novel’ was to present a complete story betweens a back & front cover appealing to readers who might not otherwise be interested in comic book stories. These were book like products as opposed to collections of several issues of an ongoing serial. Kirby, through his staggering ability, was almost single-handedly, was responsible for the parade of monthly issues coming from Marvel in the 1960s, so his work at Marvel did not relate to the emerging graphic novel form. But an argument should be made that his DC work in the 1970s was serious and did attempt whole stories. His Fourth World series, including The New Gods, Mister Miracle, and The Forever People, told an interwoven story of gods and super powered beings and was played out on a galactic stage, and because the characters were more mythic than most superheroes, the stories held appeal for audiences outside of comic book stores. Unlike previous Kirby creations, Captain America, and The Fantastic Four, for example, Kirby edited, wrote and drew his Fourth World stories. As a result, readers got Kirby for the first time unfiltered. Kirby’s Fourth World ran from 1970-73. The series was revived briefly in the 1980s, and culminated in the 1985 graphic novel The Hunger Dogs. He didn’t produce a lot of graphic novels but Kirby had a hand in the development of the form. To learn more about the history of the graphic novel, read my book, Faster than a Speeding Bullet: the Rise of the Graphic Novel, coming out in October.